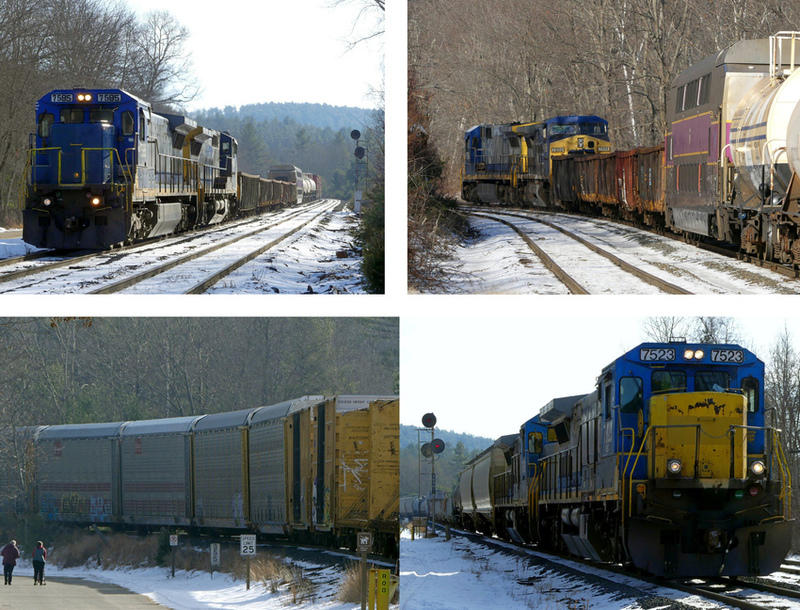 Monday morning 2/4/19 was a great opportunity to capture well illuminated eastbound PAS freights under sunny skies at South Royalston but only 2 westbounds showed up. A bit after 1000, POED arrived with an MBTA double decker heading west (to Alstom Hornell for rebuilding?) as the 6th car in the consist (Thought passenger cars were supposed to be placed on the end of the train with a following car to mount the EOT marker?). About 30 minutes later, ED9 arrived fresh from its pick-up of P&W interchange (including empty auto racks*) at Gardner. Sitting comfortably in my car parked on Birch Hill Dam Rd when I first saw ED9 coming around the bend, I was in the completely wrong place for decent lighting. Arrgh! * New normal on PAS west of Ayer is a reduction of daily road train count down to 6 given 28N/287 appear to be abolished east of Mechanicville most days with 22K/23K and EDxx/POxx handling auto traffic.